The stock market staged a powerful comeback from its worst week in two years. The Dow climbed 410 points, or 1.7%, on Monday. The average has spiked 741 points in two trading days, and both the Dow and the S&P 500 have notched their biggest two-day percentage gains since June 2016. Historic volatility shook Wall Street last week as investors worried about inflation and the future of interest rates. The selling culminated in two 1,000-point plunges that left the Dow in a correction, a 10% decline from previous highs. Ryan Detrick, senior market strategist at LPL Financial, doesn't think it's a lasting, V-shaped rebound in stocks. He predicted something more like a "Charlie Brown shirt with zigs and zags." "We don't think we are out of the woods yet," he said. "This is an oversold bounce after last week's drubbing." Bond yields, which reflect inflation worries, crept to a four-year high on Monday before backing off. Still, investors may be happy it wasn't worse. "People are breathing a big sigh of relief," said Ian Winer, head of equities at Wedbush Securities. Wall Street is showing signs of calmer trading. The Dow swung in a relatively narrower trading range of about 450 points on Monday. That snapped a streak of six straight days of 500-point swings -- and often twice as much. The VIX (VIX), a closely watched measure of market volatility, fell 12% on Monday after spiking last week. 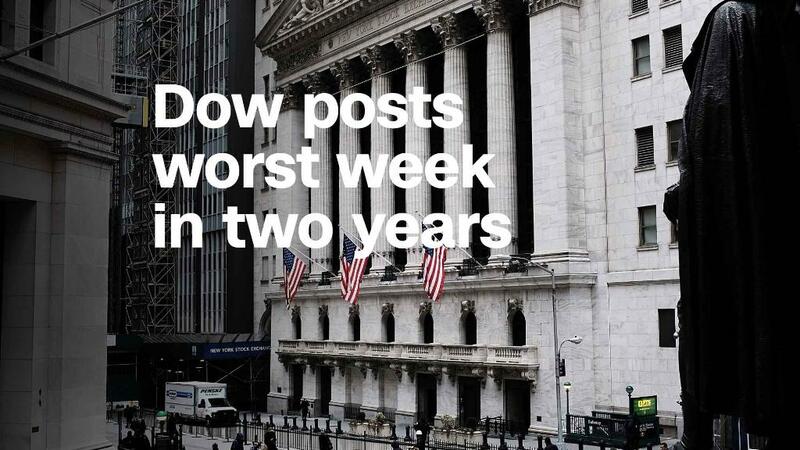 "The roller-coaster trading pattern of last week obviously caused investors to experience stress and uncertainty," said Terry Sandven, chief equity strategist at U.S. Bank Wealth Management. The Dow has recovered more than a quarter of the 2,756 points it lost between the peak on January 26 and the closing low on Thursday. The comeback on Monday put the Dow and S&P 500 down just slightly for the year and the Nasdaq up 1.1% in 2018. The rebound does not necessarily mean the worst is over. Huge swings are common during times of uncertainty. "It's premature to conclude a bottom has been reached," Sandven said. Some investors believe the market tumble represents a buying opportunity because the turmoil doesn't change the positive environment for stocks. The U.S. economy is strong, unemployment is low, global growth is picking up, and corporations are minting money. Out of the past 16 market corrections since 1976, only five occurred around a recession, according to Goldman Sachs. Markets typically recover from a correction in four to five months, Goldman said. "The probability of a recession remains well below average, given strong global GDP growth and loose financial conditions," Goldman chief U.S. equity strategist David Kostin wrote in a recent report. The stock market will probably keep taking its cues from the bond market. Investors fear that the era of low interest rates may be ending because of higher inflation, faster growth, less help from central bankers and rising budget deficits. President Trump released a budget proposal on Monday that would lift the fiscal 2019 federal deficit to nearly $1 trillion. "The biggest issue for the bond market is the fact that this deficit is going to continue to grow and grow and grow," said Wedbush's Winer. "How much will the Treasury need to sell to fund all of this stuff?" The 10-year Treasury yield has climbed rapidly from 2.4% at the start of 2018 to about 2.86%. That's a big deal because Treasuries help set the price for virtually every other asset. Higher returns for ultra-safe government debt could hurt demand for riskier assets like stocks. Analysts expect Treasury yields to continue creeping higher. A rapid rise above 3% could cause more market stress. "It's hard to envision equities trending meaningfully higher when rates are climbing," said Sandven. "We think equities will go sideways until we figure out where interest rates are likely to stay." Although the steep drops and volatile trading last week evoked memories of the scary days of the financial crisis in 2008, the market and economy are now in vastly better shape. Unemployment is at its lowest level in 17 years, and the banking system has mostly healed. But a recent piece of good economic news -- a pickup in wage growth in the United States -- has unsettled investors, raising questions about what the U.S. Federal Reserve will do next. If inflation accelerates, driven in part by higher wages, the Fed could raise interest rates more often and more steeply than previously anticipated. Higher rates would increase the cost of borrowing, potentially eating into companies' profits and making their stock less attractive. -- CNN's Alanna Petroff and David Goldman contributed to this report.